“ ‘An enemy did this,’ he replied. We had a guest pastor at church yesterday and he preached a sermon geared toward preparing us for our new pastor, arriving in 2 weeks. (yay!) However, as usual, a concept that applies to a church also applies in a marriage relationship. Maybe it will give you some food for thought, too. 1. Good seed SUPPORTS her spouse because he is her spouse and God said to. We uphold his position as our husband and follow his leadership. We don’t try to be the boss of the family and manipulate him to do what we want. We act in obedience to God, even when we don’t feel like it or think our spouse isn’t doing his part. 2. Good seed PRAYS for her spouse and puts his needs before her own. This is what submission means, despite the archaic connotation that many would have us believe. 3. 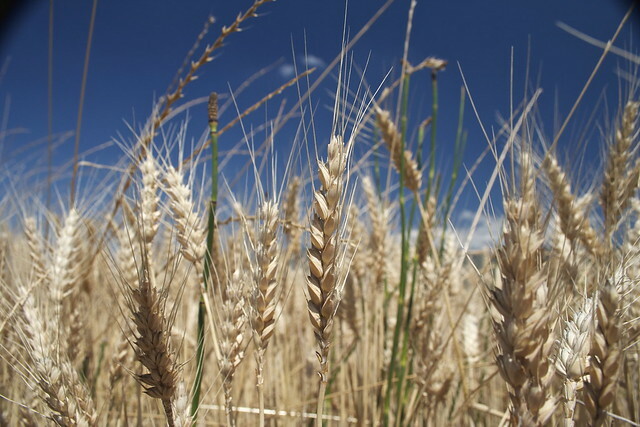 Good seed SUPPORTS her spouse personally, speaking good things to him and about him. If we must bring up a problem or conflict, it’s done in love and with an eye toward reconciliation, not hurt. Just as we have to “feed the good wolf” or nurture the good seeds in us, we also nurture our spouses. How do you nurture your spouse? 1. Good seed goes out of its way to be kind to her spouse. 2. Good seed makes time to pray for, with, and over her spouse. 3. Good seed looks for ways to serve her spouse, (speak his love language) whether it’s helping with a project, picking up the slack at home when his work is overwhelming him, fixing a special food, etc. 4. Good seed spends time with her spouse just for fun. Going to a football game when it’s not your favorite thing to do. Parking in a lawn chair in the garage when he’s working on the lawn mower. All those times when you could be doing something else– even when you have a thousand things you could be doing in the house– when you choose to spend time with your husband, he knows you’ve chosen him over all those things, and it blesses him. How can you do some nurturing today? During my recent difficult season I asked God to give me something when He needed me to write, and He did yesterday at church through our preacher! I love it when we can apply general Biblical truths to marriage relationships. The church at Ephesus had some good things going for it– hard work, perseverance, intolerance of evil, discernment of teachers– but they were going through the motions of church. They’d left their first love, and I take this to mean that they were following the rules but not serving Christ out of love for Him. Marriages– especially ones in the busy child-rearing season or long-term ones– can easily fall into this. You are fond of each other; you have the same interests, activities, and friends; life is pleasant; but there is very little one-on-one intimate interaction. No meeting of the minds or spiritual oneness, nothing that couldn’t occur between you and any other friend. I’ve been there. When children, pets, and jobs are clamoring for your attention, undemanding spouses are easy to neglect. But neglect them too long and you have a dead marriage. Brother Chuck used the words “remember, repent, and resume” from this Scripture, to apply to any relationship that needs repair. If you are in the difficult position of having an unsatisfying marriage but believe that marriage is for life and divorce is not an option, this can help. Remember the height from which you have fallen. Why did you fall in love? What attracted you? Reminisce about fun or funny (or even sad) times that you experienced together. We have a digital picture frame with many of our vacation pictures, and we love watching and remembering. When our kids get together we laugh our heads off over the same funny stories. Share what you remember about happy times. Many times in dead marriages, both partners have withdrawn, and both are afraid to take the first step toward reconciliation. Reminiscing about positive shared experiences will soften hearts. Remind yourself and your spouse of times when they were wonderful for you. When my mother was in the hospital, comatose for a week before she died, I dropped everything. I knew I could count on my husband to handle everything and everyone at home; I didn’t even consciously think about it. 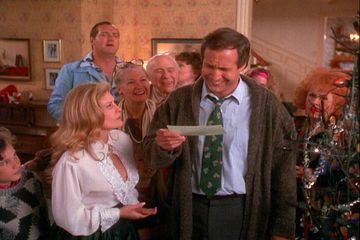 He’s buried dead pets, dug in the sewer, called principals when I couldn’t, opened jar lids, and bought me really nice jewelry! Don’t just think about those nice things, thank him out loud! God ordained marriage to represent the union between Christ and his church. He said we were to be one flesh. When we neglect or abuse our marriages, we are being disobedient to Him, and we need to repent. Ask God to reveal what you have done to add to the problem, and ask His forgiveness. You might not be to the point where you feel safe enough to ask your spouse for forgiveness. That’s okay for now. What did you do for your spouse in those early days? Speak sweet words? Cook his favorite meal? Dress yourself nicely? Take better care of yourself? (ouch) Hide notes in his pockets? Do some of those things, even if you don’t feel like it. Brother Chuck reminded us of Philippians 4:8 (Whatever…) but reminded us that 4:9 says DO THOSE THINGS! Finally, brothers and sisters, whatever is true, whatever is noble, whatever is right, whatever is pure, whatever is lovely, whatever is admirable—if anything is excellent or praiseworthy—think about such things. 9 Whatever you have learned or received or heard from me, or seen in me—put it into practice. 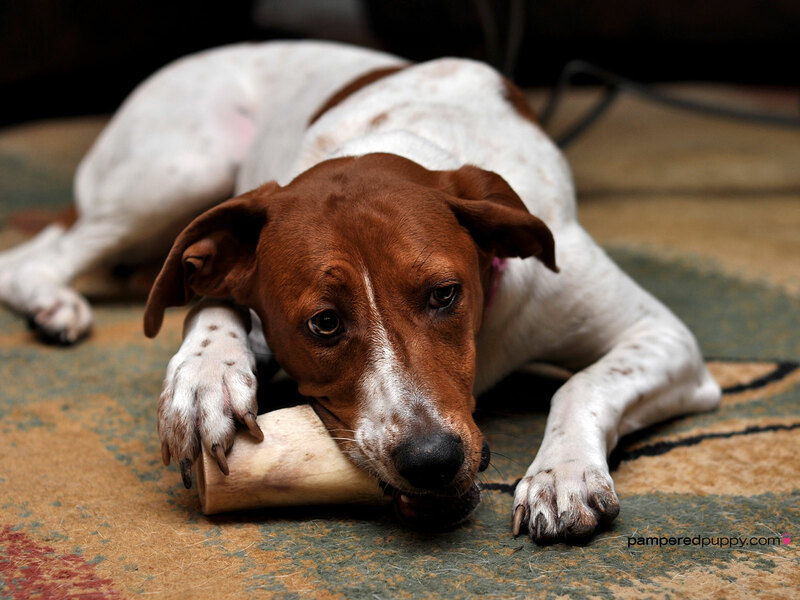 You might ask– am I expected to do things I don’t really feel like doing? (YES) Isn’t that hypocritical? (NO) It’s called discipline. Or good manners. But shouldn’t my spouse do the same thing? Yes, but don’t wait for them to act first. You’re the one who knows what to do now, so YOU start. Chances are, your spouse will reciprocate. But even if he doesn’t, you are doing these things because God said to, and if you are being obedient, He will take care of everything else. Remember that your spouse is not your enemy. The devil hates marriage and especially hates a happy Christian marriage. You are fighting a spiritual battle when you are fighting for your marriage. Use all the resources and “armor” at your disposal. 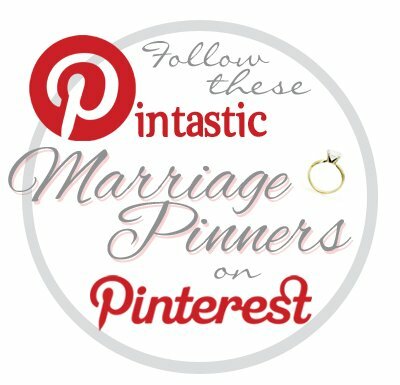 If you are new to Auntie Em’s, click on my “marriage” category and find many posts. I pray for success in your battle! 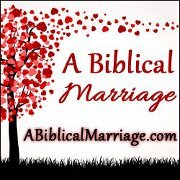 Please let me know how to pray for you, and share with my readers things you have done to build up your marriage. We have a wonderful community of brothers and sisters who are here to help and support one another. In my last post I wrote about my husband’s motorcycle accident at the end of November, and how his riding gear– a full face helmet, riding gloves and boots, and an armored jacket– saved his skin, and I believe, his life. (Read “Armor Up!” if you missed it.) I got to thinking how God provides protective armor for us spiritually, and also in our marriages. It’s important to remember that God created and ordained marriage, and it is meant to be an earthly representation of the relationship between Christ and His church. Marriages that follow God’s rules are the foundation of healthy families, which in turn build a Godly society. And our enemy hates everything about marriage. Humans can do plenty of wrong, selfish things on our own, but remember when your spouse has stepped on your last nerve that the devil is scheming against your marriage. Your spouse is not your enemy— Satan is, and all the authorities and powers of this dark world. The armor that protects our spirits can also protect our marriages. The other day a salesman counseled Mr X to buy something that was more than he wanted to spend by saying, “Well just buy it and don’t tell your wife!” (He not only didn’t buy it, but told the man that he has too much respect for his wife to do that. WOW!) I remember before I started teaching school, a close friend my mother’s age advised me to write a check for groceries a little over the amount and hold that money aside as “my” money. Telling “little white lies” to your spouse is NOT okay. Neither is neglecting to tell them something you don’t want them to know, or doing something you know they don’t want you to do and hoping they don’t find out. You’re MARRIED. You are ONE FLESH. Don’t keep secrets. Nothing about you is not their business. Deception is like a little tree that grows up between the cracks in a sidewalk; it gets bigger and bigger and eventually breaks the sidewalk to pieces. In addition to general instructions on the Christian way of life, the Bible gives Christians very detailed instructions on how to behave in marriage. (Ephesians 5:22-33; Colossians 3:18-19; 1 Peter 3:1-7 to name a few) In a nutshell: Husbands are to love their wives with Christlike love. Wives are to respect their husbands. They actually submit to one another, loving with servant love, but somebody has to have controlling interest. That’s how I see Biblical submission of wives. The husband has the ultimate authority because his is the ultimate responsibility. I rarely watch TV and one of the big reasons is that I can’t stand the way husbands and dads are belittled and made fun of. Ladies, if you badmouth your husband that is wrong. Men, if you put your own needs ahead of your wife’s, that is wrong. If we want our marriages to be protected by God’s armor, we have to operate by His rule book. A Christian home should be a place of safety and peace, an oasis in a dry and dusty land! Wives, remember It’s better to live alone in the desert than with a quarrelsome, complaining wife. 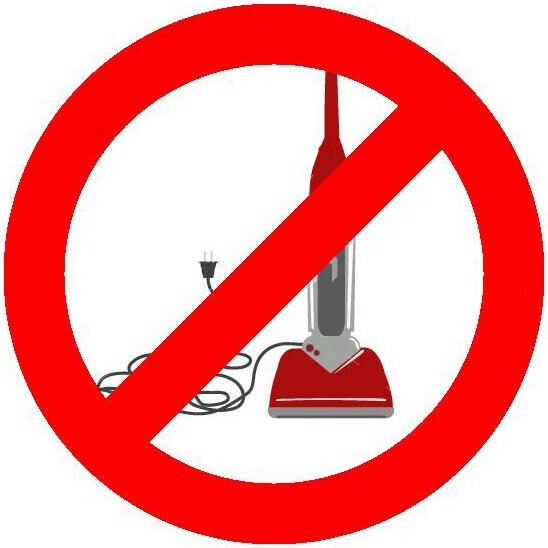 (Proverbs 21:19) Beware of husband-bashing parties that sometimes develop when a group of girlfriends get together. I know this Scripture is talking about faith in God, but faith in your spouse is an important thing, too. Don’t assume the worst when they say something wrong; look for a different explanation. (Maybe he’s not a self-centered pig; maybe he had a really bad day at work. Maybe she isn’t totally selfish and insensitive to your needs; maybe SHE had a really bad day at work!) Often we put on a happy face out in the world, then really let our hair down at home, with the one we trust the most. Be careful not to take that trust for granted. Give a warning ahead of time if you are “out of sorts” as we say in Texas. I can’t stretch this one to apply to anything but God. But to put it in a marital context, if you are both believers, you are not only husband and wife, you are brother and sister in Christ. You share a common relationship with your heavenly Father. Everything that Christ exemplified and is written about relationships — selflessness, kindness, forgiveness, longsuffering, etc— also applies in marriages. Marriages in our world today are subjected to all kinds of hazards, from sick children to leaking dishwashers to lost jobs to infidelity. The protective armor of God can deflect many of these “flaming arrows” and can give us strength to fight the battles that will come. Armor up! Have you gotten some ideas for the 12 Days of Christmas? On Monday we talked about the first six, (if you missed them, check them out here.) and today we have the last six. 6. Give a gift that keeps on giving. 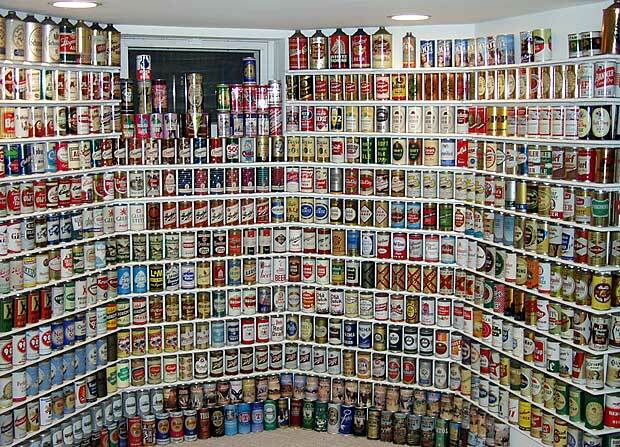 Sort of like the “jelly of the month” club that Clark Griswold was so disappointed to get! However if you make it something he likes, like a pie of his choice, or a child-free date, or a “no-guilt” guys’ night, or ironing his shirts, or whatever, he will be happy. His birthdate and your anniversary date are good times to plan monthly events. 7. Take interest in something he likes but has never really lit your fire. Like college football. Or fishing. 8. Give him a full-body massage. (You can include hanky-panky if you want, but even a HP-free massage would be much appreciated!) If you’ve never had a massage, you need to schedule one so you will know how to do it! Be sure to get some kind of massage oil– dry hands just don’t work. Coconut oil works well, and I’ve heard that olive oil does too, but you might start craving spaghetti! 10. Go all out with an “event” plan, something that he will enjoy. Plan a movie night. Let him choose; get popcorn and movie candy. A picnic with blanket, food, dessert, and outdoor activities. Visit someplace close to you that is a tourist attraction– many times there are really neat things close to home but we’ve never seen them! Then later on in the summer, I planned an overnight to Houston, with surprise visits and photo-ops that I talked about in Three Little Changes. Your husband (or wife, if you are a man reading this) just wants to know that he is important to you, and that he has a significant place in your plans and schedule. It’s very easy to push spouses down toward the bottom of our to-do list because of the permanence of the relationship. But, like a fire that is not tended, the fire in a marriage can slowly die away and be gone before you realize it. A little care, some priority time and effort, are small prices to pay for a huge dividend. If you’ve read Sunshine’s “substitute” post, or my Facebook page, you know we had a little too much excitement last weekend– my husband, Mr X, was in a serious motorcycle accident while riding with a friend. He’s going to be okay; he spent 3 days in the hospital and has a broken nose and 3 broken ribs. He also had a small pneumothorax (air between the lungs and lining that can lead to a collapsed lung; fortunately his dissipated before we left the hospital) and internal bleeding leading to a large hematoma inside his pelvis. It quit bleeding and will eventually absorb. In the meantime, he’s stiff and sore, and moving slowly, but thank God, he’s moving! His friend was also injured but able to walk– stiffly– away. I went back to work Thursday and Friday, and haven’t had a minute to write anything, or any spare brain cells that are really working that well– so I decided to do a month-end statistics report. As non-mathematical as I am, somehow I love studying statistics! 3. Give Me a Man 4. Stormy Weather? Check out some of these posts if you haven’t yet, and hopefully this week I will get some new words down. In the meantime, I appreciate all your prayers, and please keep them up! As I said on my Facebook page, the fellowship of believers (All over the world!!) is a sweet and powerful thing! 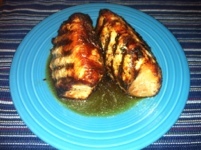 You might wonder why I’m tagging marriage in this recipe post. It’s because “Speak your husband’s language” is one of Auntie Em’s rules. One of Mr X’s love languages is acts of service. And when I serve him by cooking, he has always been very appreciative. When I make his favorite pie, which is pretty easy to make now, but at first was time-consuming and complicated, it spells L-O-V-E to him! Be a student of your husband; find out how to speak his language, then speak often! 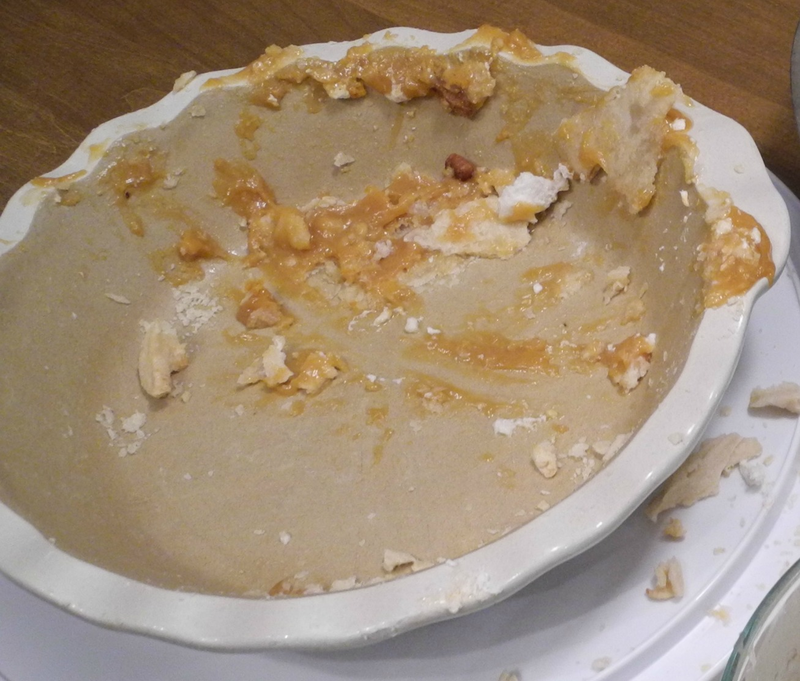 Now– on to the pie. 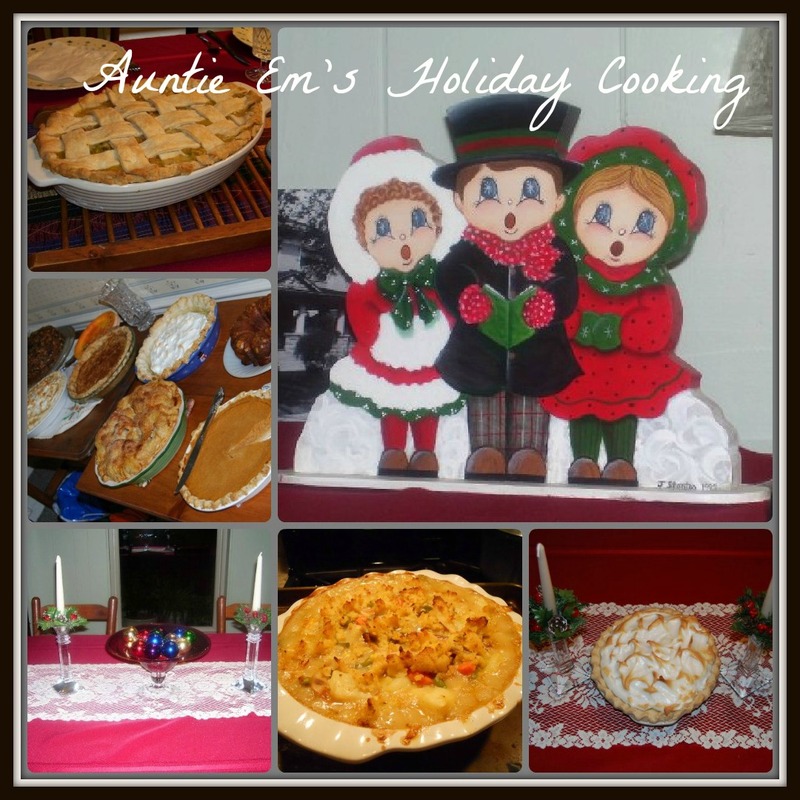 It’s not as simple as some– It uses FOUR dishes besides the pie pan! But it’s worth it. You’ll love it! 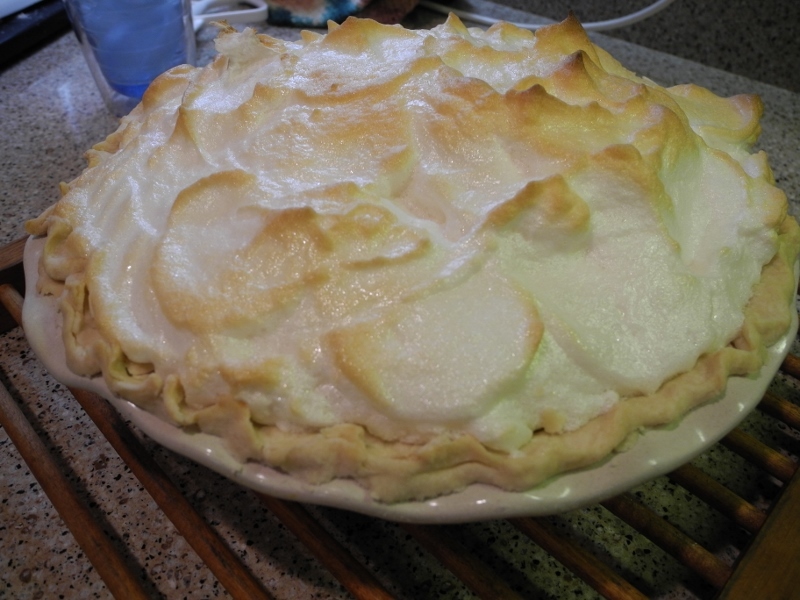 Preheat your oven to 400 so you can bake the meringue when you’re all done. Get out your dishes you’ll need: A heavy pan for mixing the dry ingredients and cooking the custard, a heavy skillet for caramelizing the sugar; a bowl for mixing the eggs and milk, and a bowl for beating the egg whites. 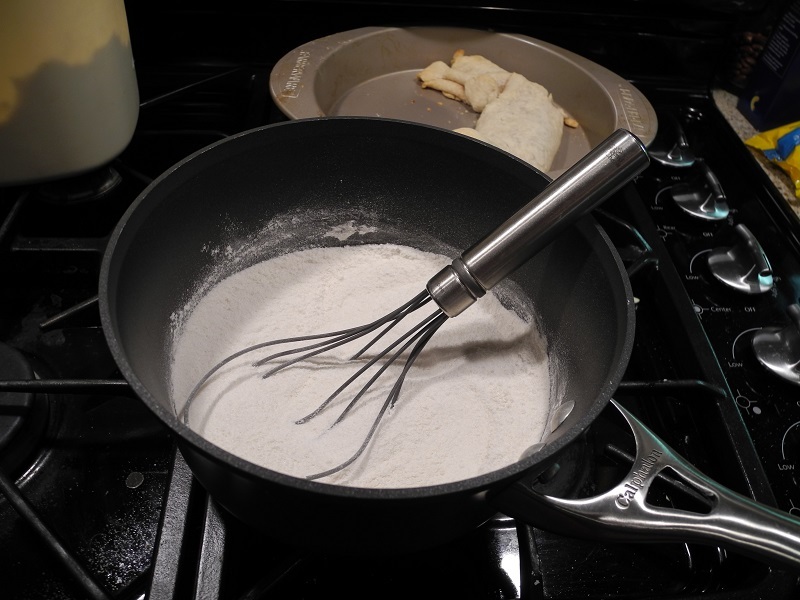 Plus a whisk for stirring the custard, a knife to cut the butter, measuring spoons and cups, and a spatula for applying the meringue. 2 3/4 C milk and 4 egg yolks. You’ll have to separate your eggs; put the whites in another bowl so you can beat them. 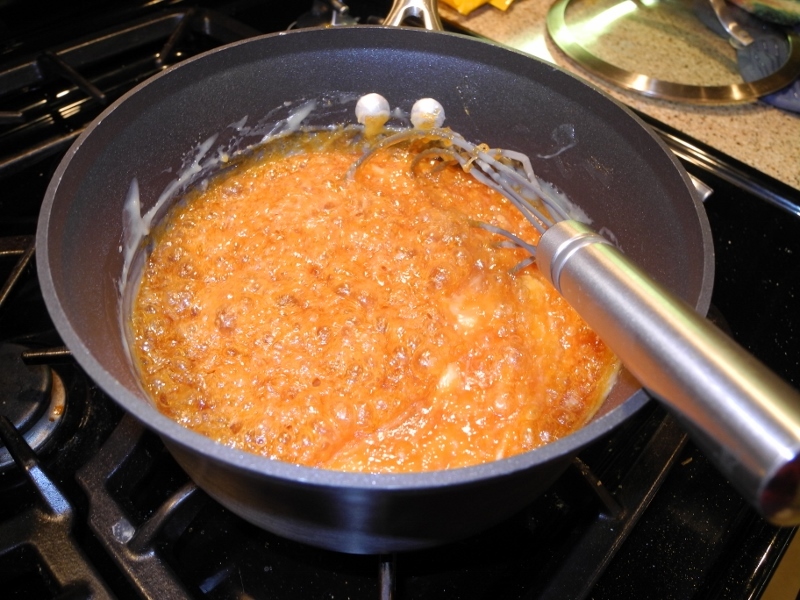 Now stir the milk and egg mixture into the dry mixture in the heavy pan. 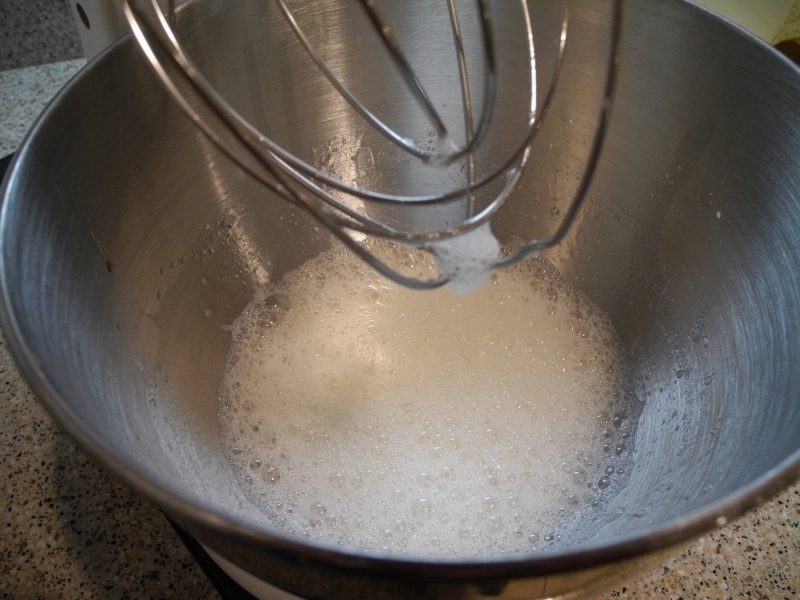 Mix together with a whisk till it’s smooth. This is the custard mixture. Heat it over medium heat. You can take a shortcut and heat it on higher heat till it begins to get warm, but watch and stir! It can burn and curdle quickly. 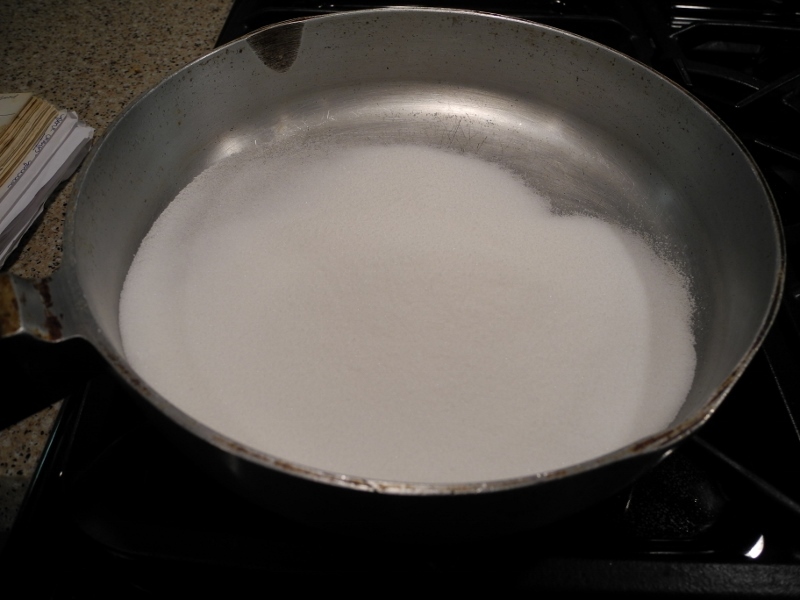 Then put 1 C of sugar into a heavy skillet; shake it to spread it around evenly. Heat over medium heat. Same as with the custard, you can start the heat higher but turn it down for more control. Now you wait. And stir the custard. And stir the custard. And wait. Don’t stir the sugar. Just wait. After 10 minutes it looked like this, just barely beginning to melt. After another 10 it looked like this. All this time I’ve been stirring the custard. 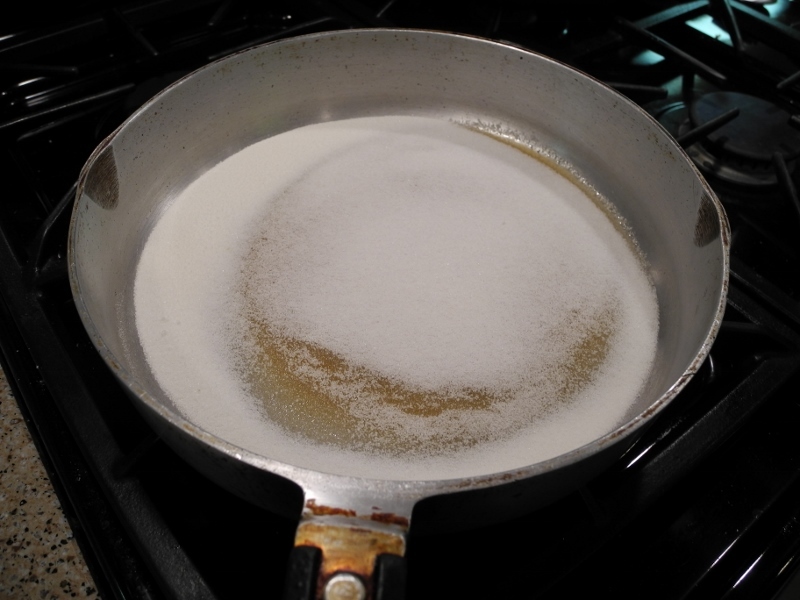 If it has thickened or begun to bubble, I turn down the heat until the sugar is melted. 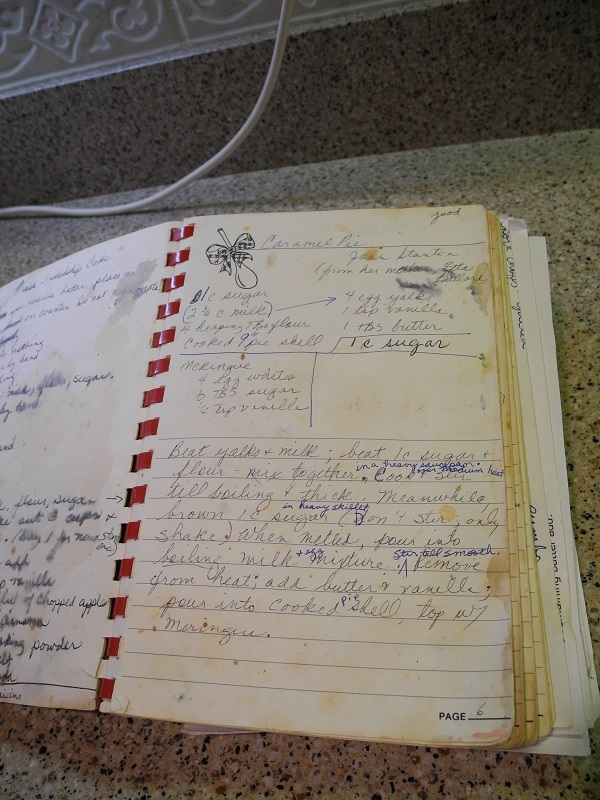 (At this point you can add the vanilla and butter and use this custard for a wonderful banana pudding! 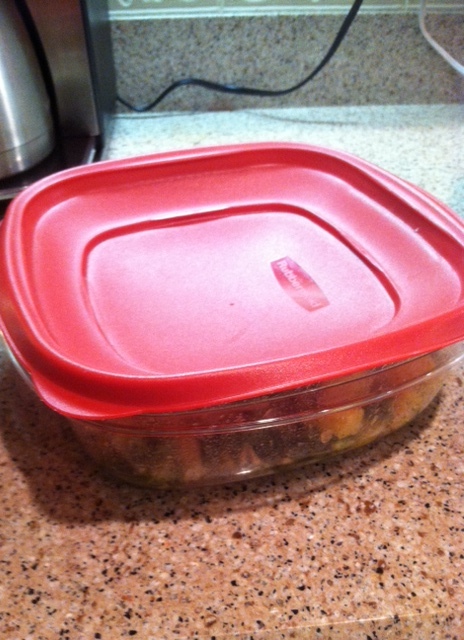 No jello pudding at our house!) Granny says never stir the sugar, just shake it around, so that’s what I do. Once all the sugar melts it’s time to be really careful. 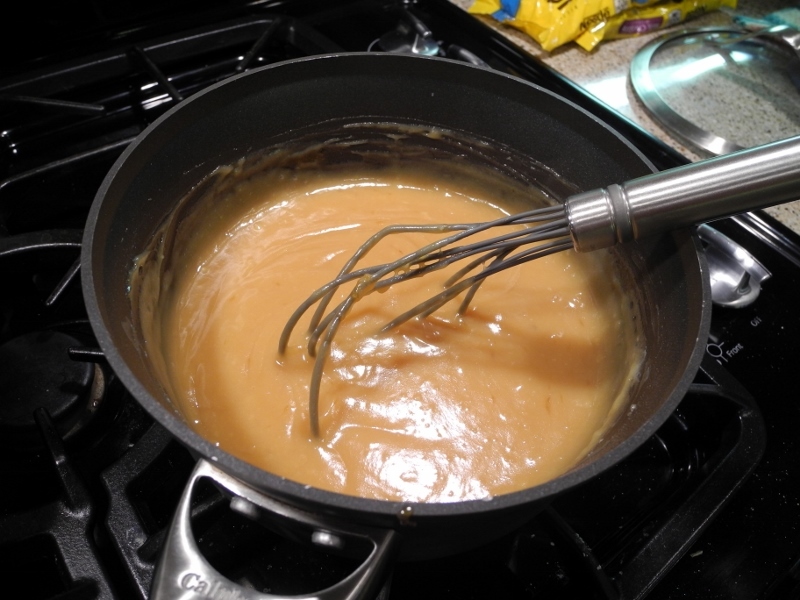 The custard has to be VERT hot, or else the caramelized sugar will cool and harden instead of blend in. When you pour it in, it will bubble up violently. Stir, stir, stir! 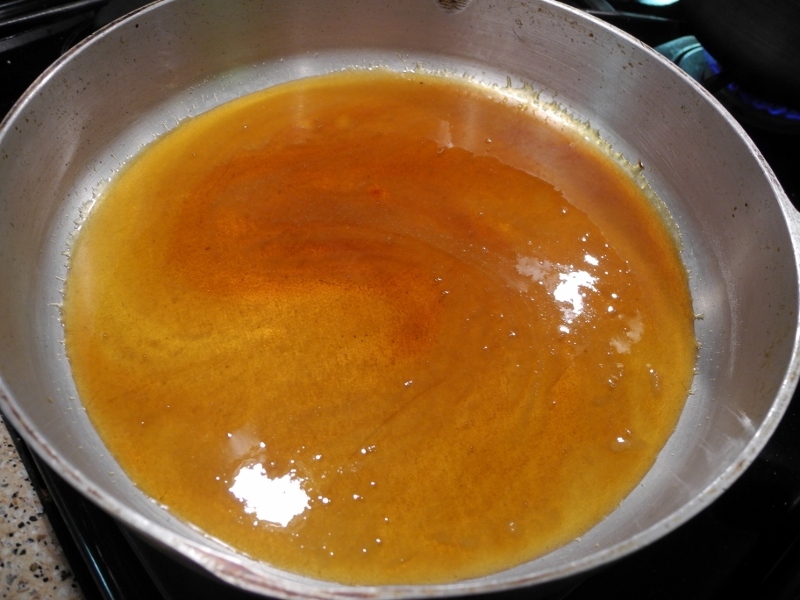 At this point, remove it from the heat and stir in 1-2 TBS butter and 1 tsp vanilla till it’s all smooth. Pour into your cooked pie shell. You’re almost done! Now you have to make the meringue topping. A Kitchenaid stand mixer makes quick work! 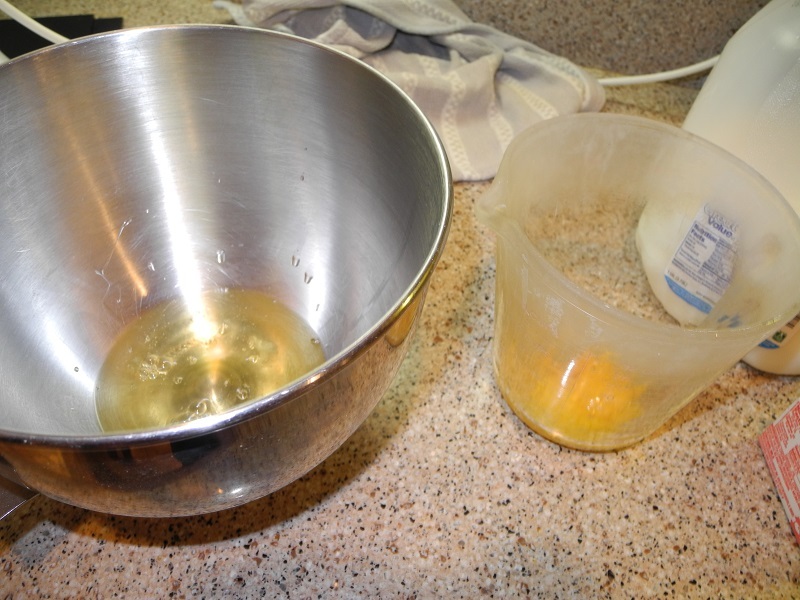 Add 1/2 tsp cream of tartar and mix the 4 egg whites on high. 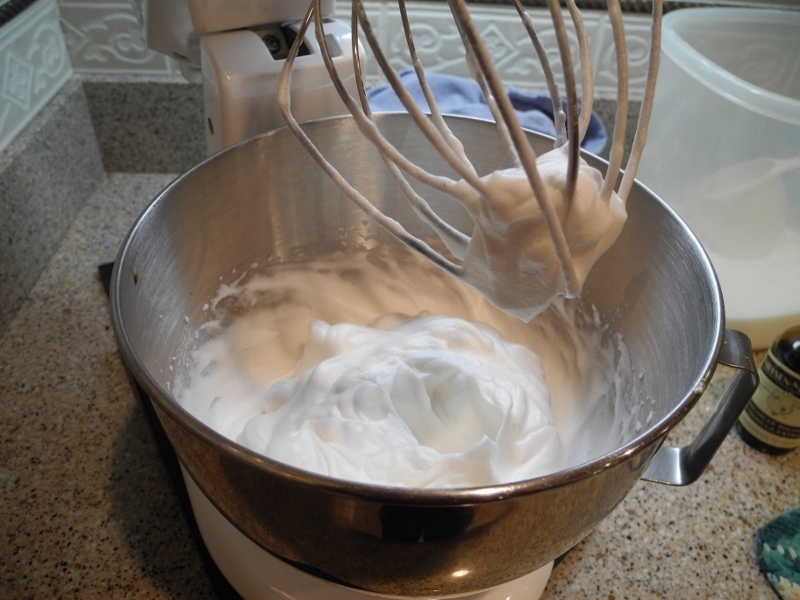 When “frothy” like the first picture, add 4-6 TBS sugar and 1/2 tsp vanilla. 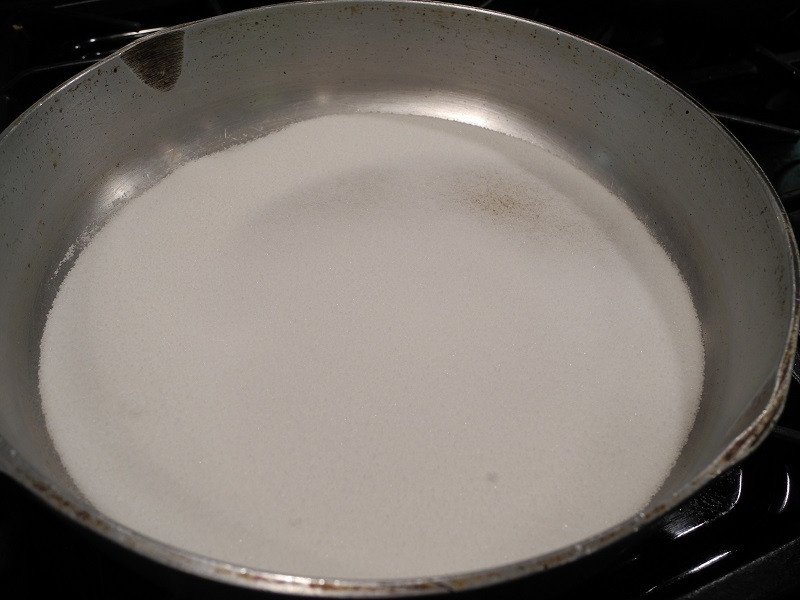 Beat till stiff peaks form– that means when you lift the beater it sticks and the mixture in the bowl keeps its shape, like in the second picture. Now gently place blobs of meringue onto the hot pie filling. 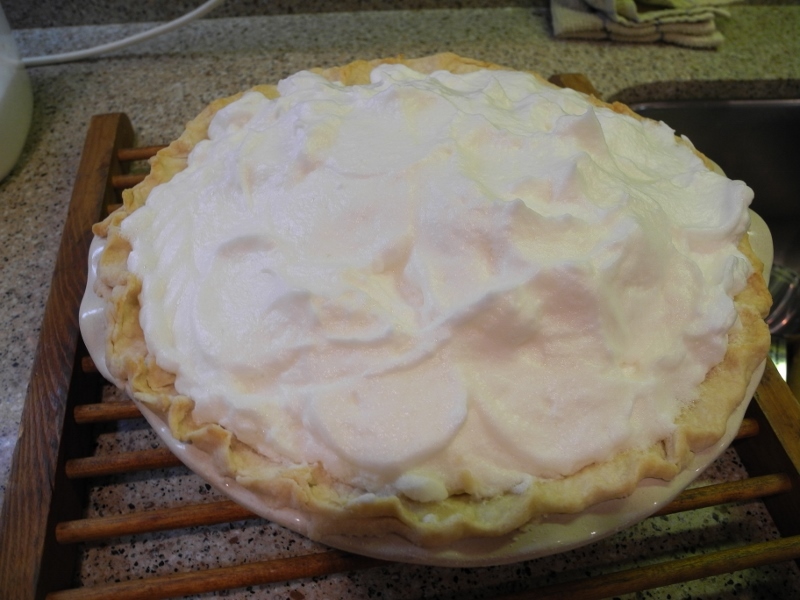 You don’t want to do a lot of stirring because that will get the filling all over the meringue plus get the air out of the meringue, which will cause it to deflate. That’s bad. 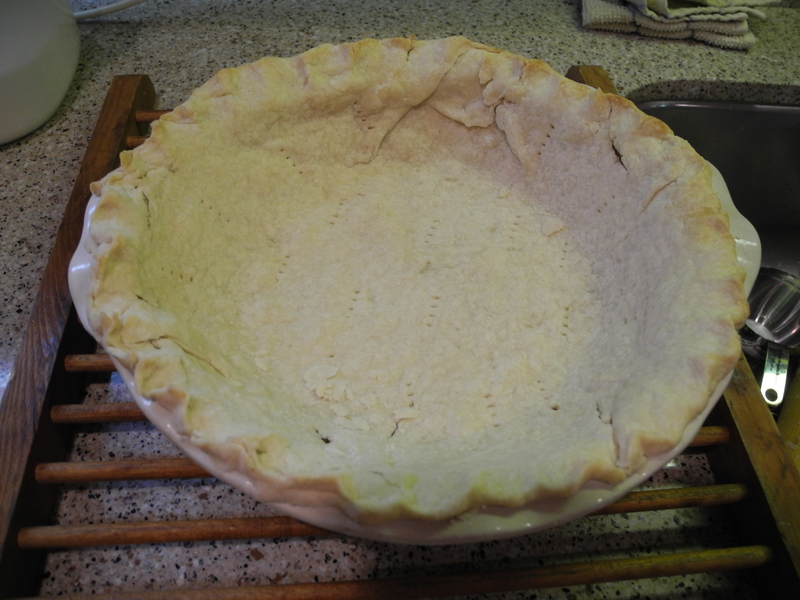 Gently connect the blobs to form a solid surface, and press to the sides of the pie crust to seal. 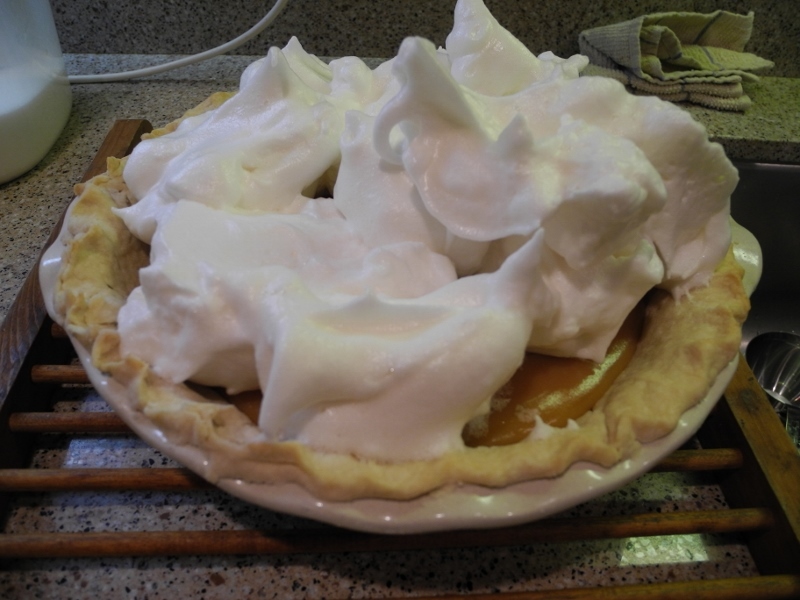 Now, cook the meringue till it’s as brown as you like, at 400 degrees. This was about 4 minutes. 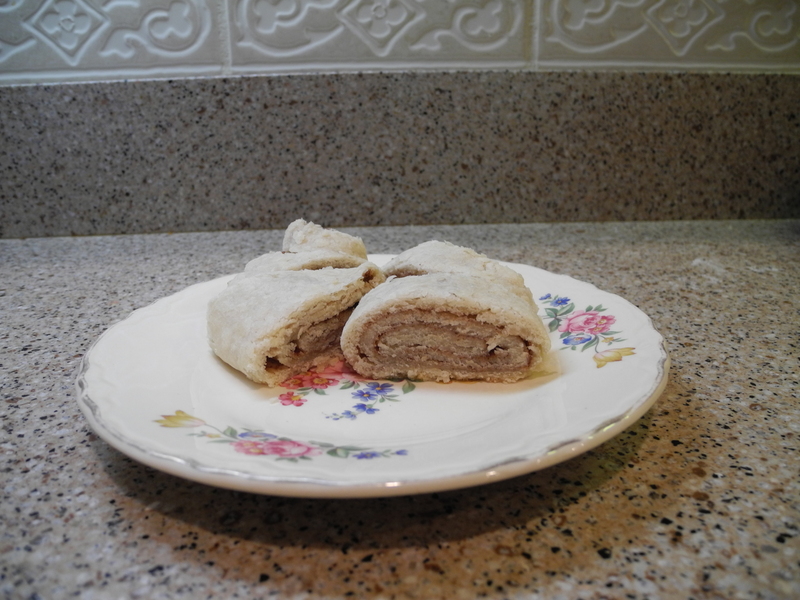 Any time I make a pie crust, I make enough so I’ll left some left over… because I would have a very sad husband if I didn’t make a cinnamon roll! 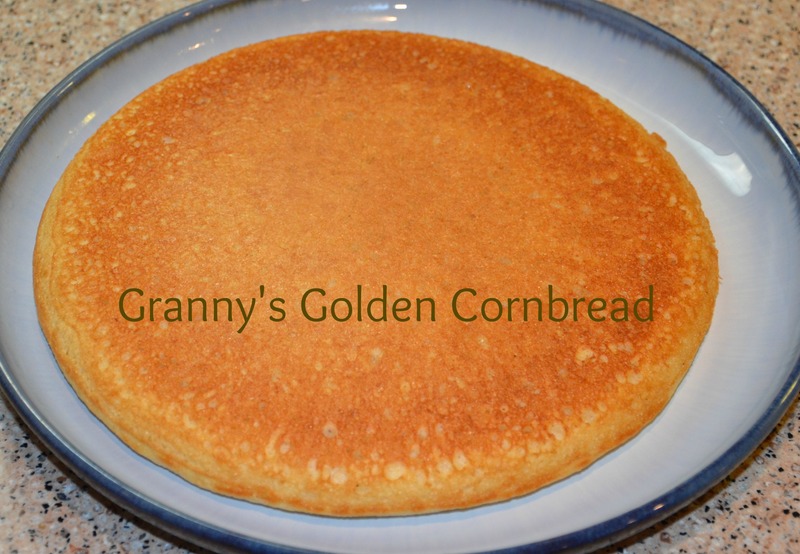 My mother-in-law, Granny, (of Granny’s cornbread fame) started this tradition, and it continues to this day. It’s really funny to watch Mr X and his sister fight over it! We live very close to Granny and PawPaw, go to church with them, and eat Sunday lunch together almost every week. Aunt Kathy lives in Houston so we don’t get to see her nearly as often. When Granny makes Mr X a cinnamon roll (or peas, or some other favorite), he will text her a picture and goad her about being the favorite child! I don’t guess you ever outgrow sibling rivalry. Okay– you’ve made your homemade pie crust. YAY YOU! 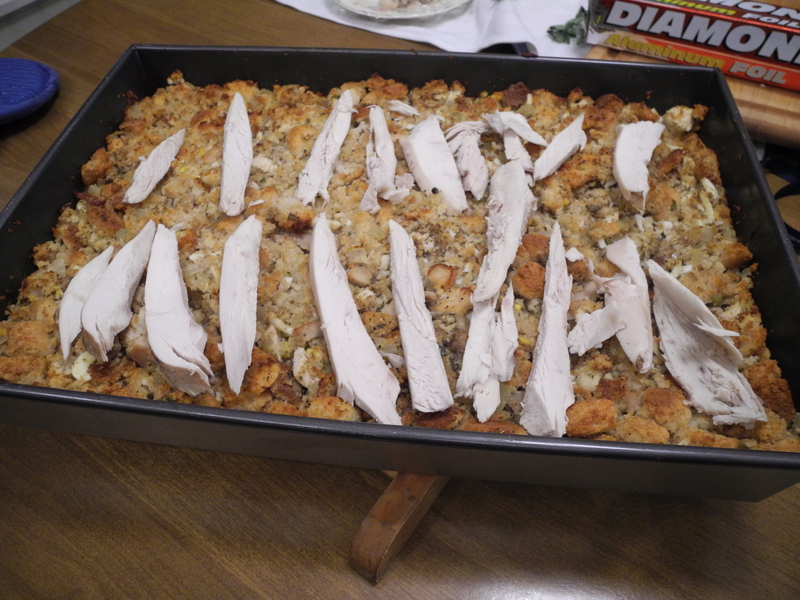 Gather up any scraps you trimmed off, and any dough left in the bowl, and roll it out in an oval or rectangular form. You never want to mix and mash it any more than necessary; it will become tough. 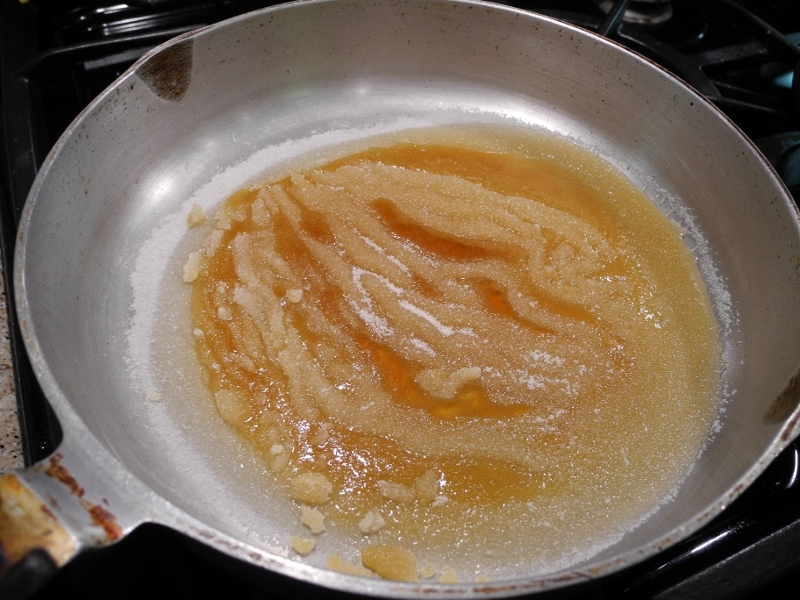 Smear with lots of butter– melted if you want. (I didn’t use enough in the video.) 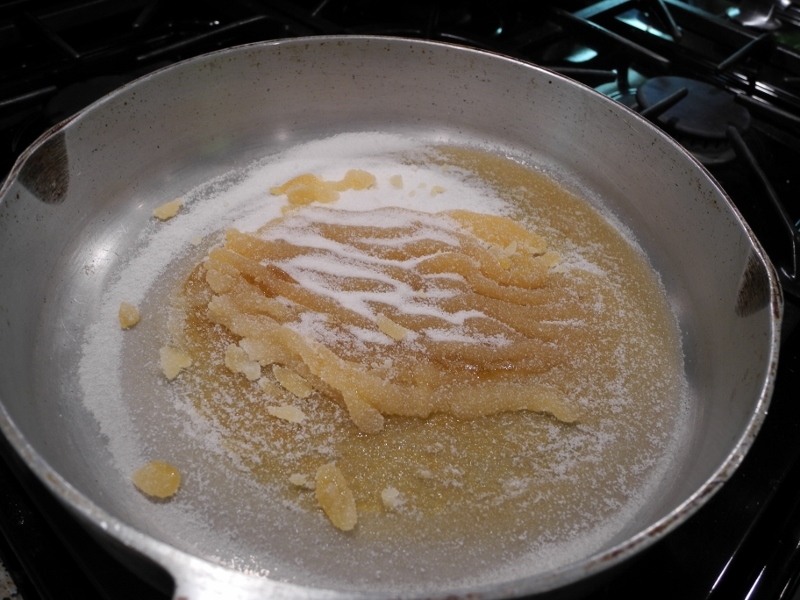 Then sprinkle cinnamon sugar all over it. I mix up cinnamon and sugar and keep it in a shaker. Bake at 400 for 10-15 minutes. Start your own family tradition of encouraging sibling rivalry! !